I am a firm believer in a Fall vacation. A vacation that hits about mid-October, one before the crazy holiday season and one after your exhausting summer! It’s a great way to recoup after a long summer and the best way to mentally prepare for the craziness that is to come! Plus, October is considered the off-season for many travel destinations and there’s nothing more relaxing than saving a few bucks! This year, we’re headed to London, England in October and we couldn’t be more excited. To us, it sounds like the perfect place to visit in the Fall. 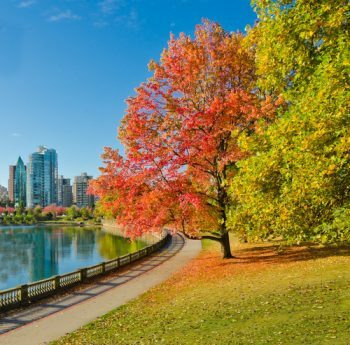 Vancouver is characteristically cool all year long, so if you crave that classic fall chill, head to Vancouver with one (or more) of your favorite sweaters. If good photo ops are what you’re about, visit the VanDusen Botanical Gardens or head to the Capilano Suspension Bridge for a stunning hike complete with all of the best fall colors. Or you can immerse yourself in the most Canadian activity there is by heading to a hockey game!